President Ram Nath Kovind on Thursday said that the Citizenship (Amendment) Bill, 2016 will make it easier to provide Indian citizenship to those who had to take refuge in India after facing oppression somewhere else. “They were not at fault, they were victims of situations like that,” the President has said on the contentious issue during his customary speech in the Parliament. 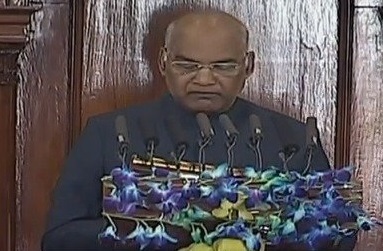 Addressing the joint sitting of the Lok Sabha and the Rajya Sabha, President Kovind said that implementation of the Goods and Services Tax (GST) has made business easy in every part of the country, adding that demonetisation was an important step taken by the government against black money and corruption. “Under the Jan Dhan Yojana, 34 crore people have opened a bank account and almost every family in the country is connected to the banking system. According to an international agency, 55 percent of the total bank accounts opened between the year 2014 and 2017, were opened in India,” President Kovind has said. He also said that the country is set to induct the Rafale fighter aircraft and improve its defense capabilities, in the times to come. Earlier, Kovind began his speech with invocation to Mahatma Gandhi, Dr B R Ambedkar and Basavanna. This was the president’s last speech in the 16th Lok Sabha. President Kovind was received by Vice President M Venkaiah Naidu, Prime Minister Narendra Modi and Lok Sabha Speaker Sumitra Mahajan on his arrival at the Parliament.